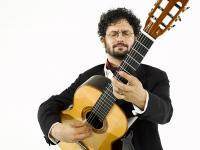 The classical guitarist Aaron Larget-Caplan, a resident of Uphams Corner, will perform at the First Church in Jamaica Plain on Friday in a solo concert covering Bach, Gershwin, and Mussorgsky, as well as his own contemporary pieces. The event, which is being hosted by Eliot Street Soirée, starts at 7:30 p.m.
Larget-Caplan loves living in Uphams Corner, a diverse and beautiful neighborhood steeped in so much history. The upcoming concert, he said, is an exciting opportunity for him to share his personal spin on music from all over the world with those in his neighborhood and beyond. Tickets for the event are $15 and can be purchased at brownpapertickets.com/event/2905806.